I've got a fun way to end the week today and it's with a fun little photo shoot that incorporates so much of what we love about summer - lemonade, mason jars, strawberries, and dining on the porch. Paige of Paige Hiller Photography and Carey of Lasso’d Moon utilized space at the Blue Horse Inn in Woodstock, VT to put together a shoot that was whimsical and eclectic with a bright summer-y feel. 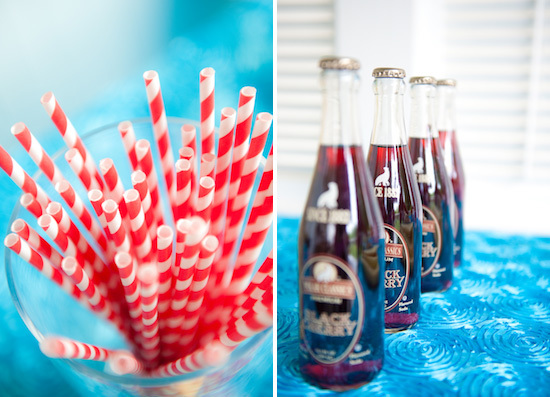 Weddings, Tents and Events supplied the gorgeous turquoise blue ruffled tablecloths, as well as the glassware. Don't you just love this linen? It reminds me of the pool. For the table settings, Carey and Paige utilized what they had in our own china cabinets . . . Carey provided the pretty scrolling white dinner plates and the smaller dessert plates, and the tea cups were from Paige’s personal collection. Jenna of Piper Designs lent her styling to putting the flowers and other items together into a cohesive look. For the flowers, the team chose to go with carefree yellow bouquets in blue mason jars and incorporated natural elements into the decor, like fresh lemons and strawberries. For the stationery, the place cards, lemonade sign and invitation featured custom calligraphy and fun stripes in shades of yellow. DIY GOODIE : Carey is offering a printable version of the "Fresh Squeezed" lemonade sign as a download for you today. Simply download the file here and you can print out your very own sign for your summertime festivities.